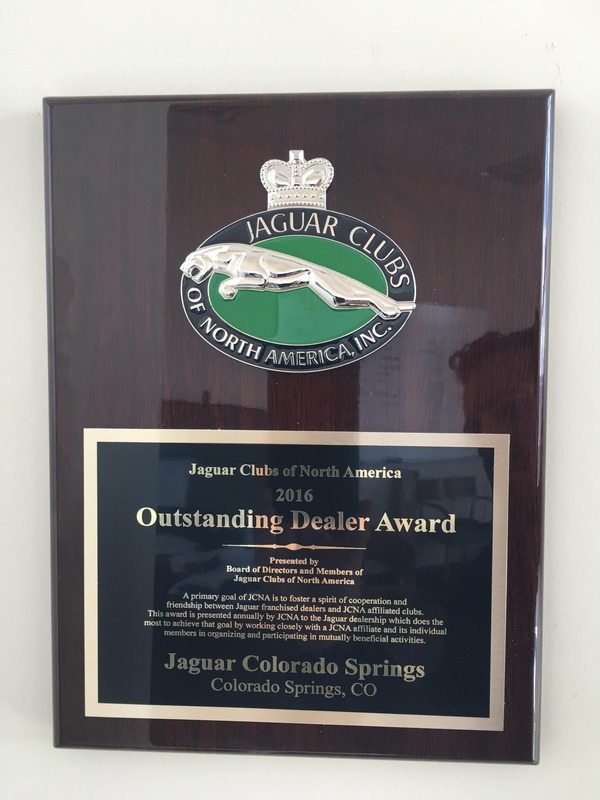 Jaguar Colorado Springs is proud to have been selected as the Dealer of The Year for 2016 by the Jaguar Clubs of North America. The JCNA Dealer of the Year Award recognizes a Jaguar Dealer for their relationship with their local JCNA Club. Jaguar Colorado Springs is proud to work closely with the Jaguar Club of Southern Colorado. JCSC President, Donald Yowell presents Thom Buckley, Dealer Principal of Jaguar Colorado Springs, the 2016 JCNA Dealer of the Year Award. Jaguar Colorado Springs has been working with JCSC for many years, hosting their monthly club meetings, the Annual Pikes Peak Concours d’Elegance and many other events and festivities. 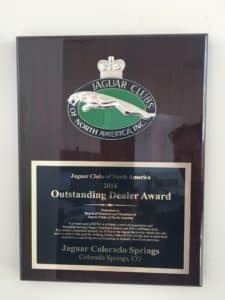 The Dealer of the Year award is also a tribute to the Jaguar Club of Southern Colorado as they help promote the love and enthusiasm for the Jaguar Automobile and it’s history. The JCNA Dealer of the Year Award was presented the first time at the Annual JCNA Meeting in 2000. 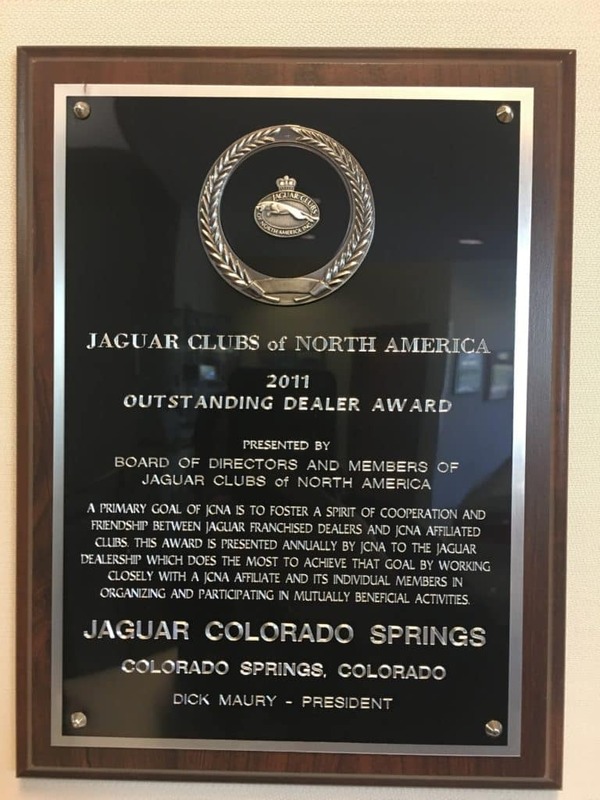 Jaguar of Colorado Springs has the distiniction of being one of three dealers to ever receive the award twice. 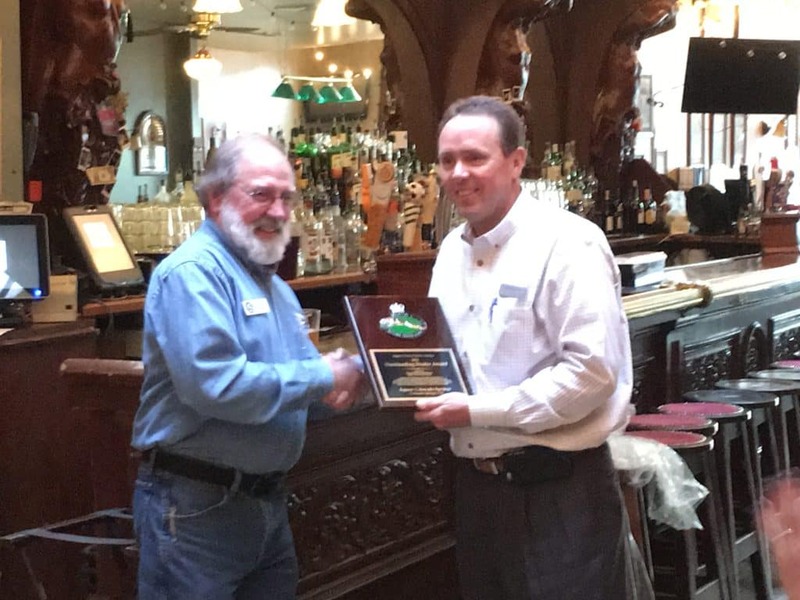 We are honored to have been nominated by the Jaguar Club of Southern Colorado for this award! Look for many more amazing events and club happenings to come from our amazing relations with Jaguar Club of Southern Colorado! You can also find JCSC on Facebook.